Law enforcement agencies have carried out an operation in Lankaran city, according to a joint statement issued by the Prosecutor General’s Office and the Ministry of Internal Affairs. 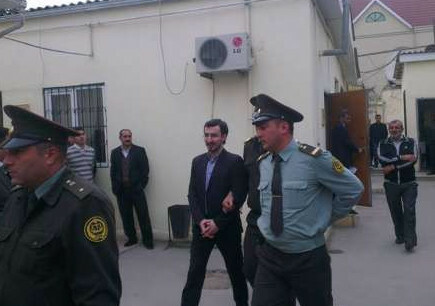 According to the statement, as a result of the operational search actions carried out, the law enforcers arrested Lankaran residents Gismat Isayev and Vugar Ismayilov, who had been spreading separatist ideas on national and religious grounds among people and calling for mass disobedience and open confrontation with law enforcement authorities. The statement further reads that during the search of the persons and the houses of these individuals, who are supporters of Taleh Bagirzade – the director of the so-called organization Muslim Union Movement, 4 hand grenades, 123 cartridges, 2 TNT blocks, as well as 18 booklets promoting religious intolerance and division, the circulation of which is prohibited by law, were seized. A criminal case has been launched on the fact and is being investigated. Background: Muslim Union Movement chairman Taleh Bagirzade was arrested in an operation conducted by law enforcement officers in Nardaran settlement of Baku on November 26, 2015. According to the Prosecutor General’s Office, 58 people were arrested in connection with the Nardaran events. The Serious Crimes Investigation Department under the Prosecutor General’s Office launched a criminal case on the fact and those detained were charged under Articles 120 (deliberate homicide), 214 (terrorism), 220 (mass disorders), 228 (illegal acquisition, transfer, sale, storage, transportation or carrying of firearms, their accessories, ammunition and explosives), 233 (organization of actions promoting infringement of public order or active participation in such actions), 278 (violent seizure or maintenance of power), 283 (inciting national, racial, social or religious enmity) and 315 (resistance or violence against a representative of authority) of the Criminal Code.